I first saw this watch on the wrist of fellow TimeZoner Tim Lee at my first ever TZ dinner in November, 1998. Tim sat across from me and I was immediately captivated by the beautiful blue dial on his watch. I decided that night I must have one. I did some quick research the next day and learned that the MSRP is only $695 on strap, $795 on a bracelet. Rarely is a watch I truly like available at such a reasonable price – and Christmas was just around the corner. I began dropping subtle hints to my wife. “Boy, I saw a beautiful Fortis at the TZ dinner. 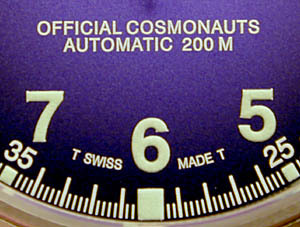 It’s the blue dial diver’s model. One of those would sure make a great Christmas gift.” OK, I wasn’t subtle, but it worked, and so began the hunt. In a short time I located the watch, and in a few days it arrived at my doorstep. I wore the watch on its original blue strap for a few months. 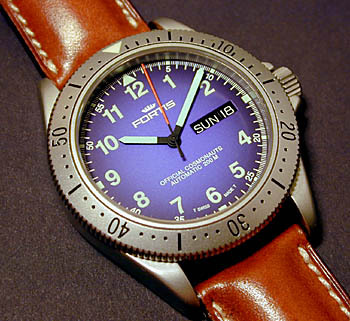 Fortis offers black, yellow, green and red leather straps in addition to blue. A bracelet is also available for $100. However, I eventually decided on the padded brown or tan leather sports strap pictured below. This combination took some getting used to, but I like it. At first glance, this watch appears to be made of titanium. It is actually stainless steel, sand blasted or micro sanded to a uniform matt finish. The case is 38 mm in diameter, not including the crown, and 12 mm thick. This watch takes a 20 mm strap. 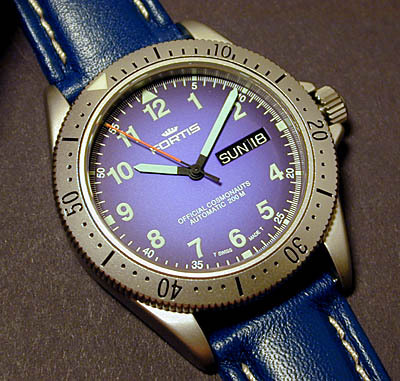 This Fortis has a sapphire crystal with anti-reflective coating on both sides. The coatings are quite effective, as the crystal seems to almost disappear. This watch has a screw down back and crown, and it is water resistant to 200 meters/660 feet/20 atm. 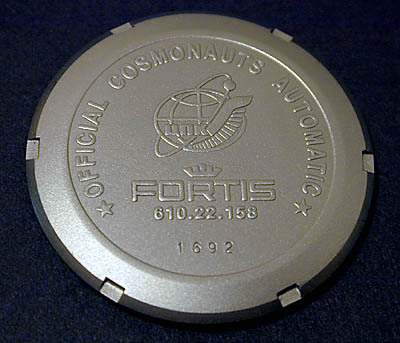 The crown has a small Fortis logo, and it is protected by shoulders on the case. The case is nicely executed. The bezel is unidirectional, and it takes a fair amount of force to turn it, which I like. The bezel engraving is well done, and the luminous mark on the bezel is large and glows brightly in the dark. 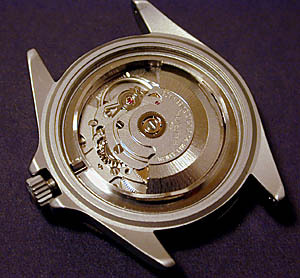 The caseback, shown below, is nicely engraved with the Fortis name and logo, a serial number, and the logo of the Yuri A. Gregarin Cosmonauts Training Center at Star City. The dial is simply wonderful. Very well executed, with the deep blue at the center fading to black at the edge. This is one of the most striking watch dials I have seen. The dial is not only very good looking, it is highly legible due to the color, the simplicity and the generous use of tritium on the large arabic numbers and on the hands. The minute hand extends right to the minute markings on the dial, so a quick glance is all it takes to tell the exact time. The seconds hand is flourescent orange. It seems to float above the dial, and it stands out in stark contrast to the deep blue behind it. This is my most legible watch, day or night. All printing on the dial is very crisp, and the tritium is nicely applied. The day and date are quick set. In the second crown position (one click out from the winding position), the crown is turned counterclockwise to change the day and clockwise to change the date. The days of the week are shown in your choice of English or German. This Fortis uses an ETA Caliber 2836-2, automatic winding, 25.6 mm or 11 1/2 lignes in diameter and 5.05 mm thick. 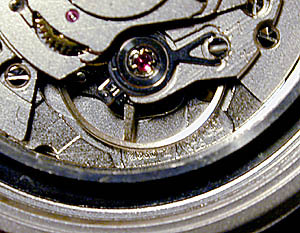 The movement has 25 jewels and beats at 28,800 vph. 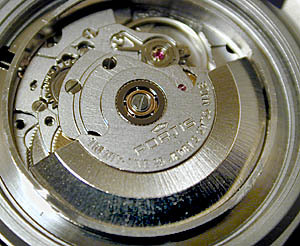 This movement uses a Nivarox spring and Novodiac shock protection. The power reserve is 42 hours. The movement is undecorated, and the overall finish is good but not spectacular. The finish is as much as is needed to obtain good performance without going into the realm of that which pleases the eye and empties the wallet. Keeping in mind the MSRP of $695, and given the other strengths this watch offers, I feel this movement is appropriate to this watch. I have owned this watch for about 9 months, and it has given me almost flawless service. The sole difficulty occurred on perhaps 2 or 3 occasions several months ago. I had a problem winding the watch – the crown did not want to turn. I was able to remedy this by pushing the crown in and pulling it out again. Otherwise, this Fortis has been trouble free. I recently compared it with my Radio Shack atomic radio signal clock and found it running at + 8 seconds per day. I consider this quite acceptable given the price and the fact that I have not had the watch regulated since I purchased it. This Fortis is a good value and a lot of watch for the money. It offers striking good looks that set it apart. If you know watches, one look and you know who made this one. This is an honest and reliable automatic watch that I am very happy to own. Watch: Fortis Official Cosmonauts Automatic Day Date (identified in some publications as the Official Cosmonauts’ Sport Diver Automatic. Functions: hours, minutes, center seconds, day/date at 3. Ref. Numbers – blue dial: 610.22.15 strap, 610.22.15M bracelet. Black dial: 610.22.11 strap, 610.22.11M bracelet. MSRP: $695 on strap, $795 on bracelet. Stainless steel case 38 mm wide x 12 mm thick, sapphire crystal with anti-reflective coatings, ETA 2836-2, 25 jewels, 28.800 vph, 42 hour power reserve, Nivarox balance spring, Novodiac shock protection. 200 meter/660 feet/20 atm water resistance. Contact Fortis: 1-800-358-9212; 1-570-822-1900. 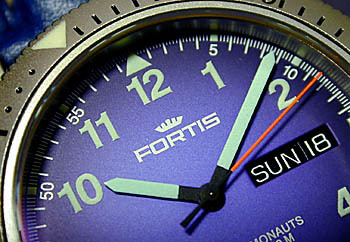 Website: www.fortiswatch.com.